This quick and easy dish is a great served alone as an appetizer or as a complement to light meals. It goes particularly well with fish, and is a worthy companion to Japanese sake. (1) Slice the turnips, and cut the turnip greens into thin strips. (2) In a sealable plastic bag, combine all ingredients. Rub to mix the ingredients. (3) Set aside for a while to allow the flavors to soak in. 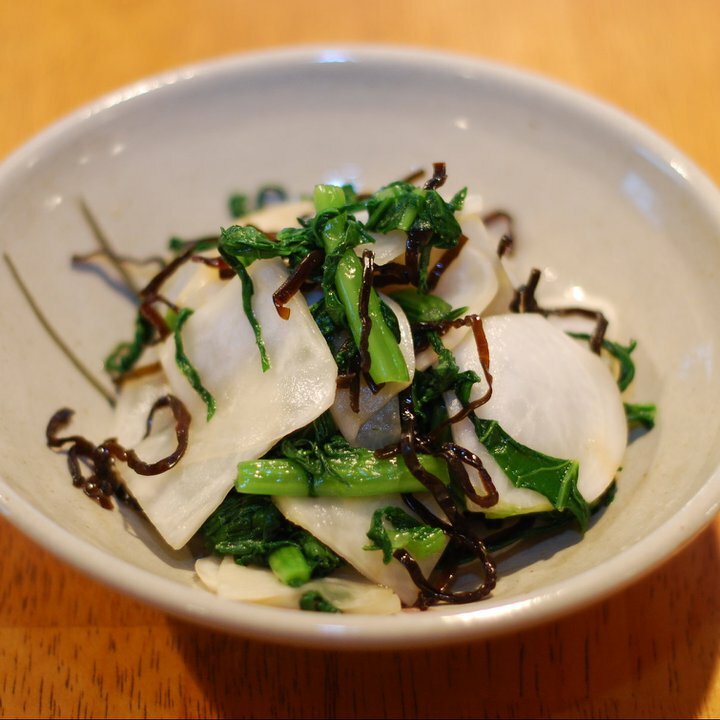 “Shiokonbu” is a mix of salt and konbu seaweed that can be found at any Asian supermarket with a good selection of Japanese products. Fish stock can be substituted for shiokonbu; the recipe can also be made with salt only, though the “umami” taste will be lost.